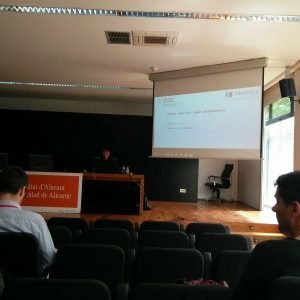 The conference write-up is in two parts, here is day one. You can read about day two here. The conference kicked off on day one with Weronika Szeminska presenting her co-research carried out with Adrian Wiech, on the ideal legal dictionary software for translators. Weronika outlined the difficult task for legal translators of having to translate legal terms correctly from the source language into the target language. Often translators are not legally trained and yet in order to carry out their job correctly they must be able to understand legal concepts in both the source and target language and terminology is not always directly translatable. Currently, there is a lack of adequate tools for translators and although various software and dictionaries exist, very often these provide a rough and inaccurate translation and fail to highlight the nuances and specific usage of the terms. Weronika’s ideal dictionary would in fact be a system of dictionaries contained in a piece of software, with five parts to help the translator throughout the many stages of translating a legal text into the target language. These five parts being – explicative, contrastive, equivalents, combinatorial, concise. The explicative dictionary provides definitions of legal terms in the source language. The contrastive dictionary gives legal equivalents of the source language in the target language including definitions. The equivalents highlights the degree of equivalence, for example if it is a direct equivalent or not. The combinatorial dictionary gives information about the grammatical usage of the term and how to use it correctly. The concise dictionary contains the most important information from all of the other four parts. Many participants in the conference were legal translators and agreed that there is a lack of adequate tools for legal translators. Some people mentioned that they rely on Linguee and Translegal but that there is a need for further development of tools in this area. The problem is that this requires money and man-power. Marion Charret Del Bove spoke about the type of language trial judges in the Crown Court, (England and Wales) use to direct the twelve jurors of the jury, whose role it is to determine whether the defendant in a criminal trial is innocent or guilty. The judge must communicate using legal-lay language in order for the lay-persons of the jury to correctly understand the directions. 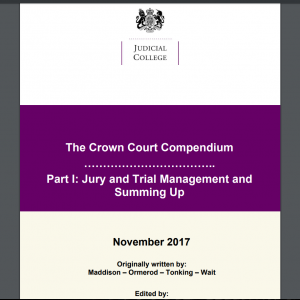 Marion focused on the Crown Court Compendium (2017) which provides guidance on directing the jury and which was peer reviewed by the Plain English campaign and she analysed the vocabulary and phraseology used by actual judges in directions. In the Q&A participants had mixed feelings about whether directing the jury in plain English is effective. Whilst this may on the one hand make jurors feel more comfortable and included in the process, it could be at the expense of them truly understanding complex legal terms. Maria Angeles Orts contrasted the language used within legal opinion columns written by legal professionals in two separate newspapers; El Pais (Spanish) and the New York Times (English), therefore comparing language used in an adversarial (common law systems) vs. inquisitorial systems (civil law systems). She concluded that emotive language was more common in the American corpus whereas the Spanish corpus was more impersonal. 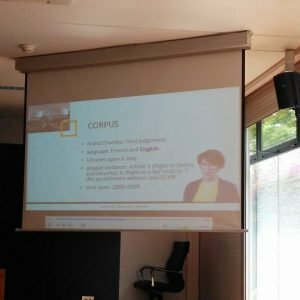 Samantha Cayron spoke about various corpus linguistic tools such as Antconc, free software which can be used to study the use of legal language. She carried out a comparative study of French, Spanish and English corpus and legal language to highlight the difficulty of choosing the correct or most appropriate legal translation and also highlighted the most common translations used within the documents analysed. According to Samantha, acquiring corpora is one way for translators to acquire legal competence. 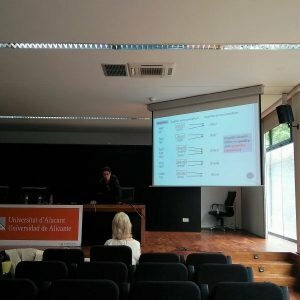 Maria Jose Marin Perez (part of LACELL a research group on Applied Linguistics) spoke about Latin terms in legal English. We have all seen Latin terms – ‘Ratio Decidendi’ ‘Obiter Dicta’ ‘Per se’ but how significant are these in practice? Samantha analysed a 2.5 million word corpus of judicial decisions from the British National Corpus BNC and found that although Latin terms are not so frequent in legal texts they were well distributed and still relevant in legal writing. Katia Peruzzo was not present at the conference, but she had prepared a video of her talk which was very engaging and she even managed to make the participants laugh with a few jokes! She spoke about the legal terminology used by the ECtHR which has the official languages of French and English. Katia analysed judgments in Italian cases which were published in English investigating how Loan Words and Loan Translations in Italian are used in ECtHR, finding that Couplets were the most common. Eva Samiego Fernandex shared the immense challenge of teaching legal English courses to legal professionals spanning THIRTY jurisdictions. For many years Eva has run courses for the European Judicial Training Network, the European Academy of Law, the European Union’s Judicial Cooperation Unit and the Spanish General Council of the Judiciary. The courses are always run with a linguist and a lawyer who have the task of helping the judges, lawyers, and other legal professionals understand the subtle differences between certain legal terms. For example, she highlights false friends such as ‘Magistrado’ in Spanish and ‘Magistrate’ in English and she teaches the distinction between informal legal-speak and formal e.g. ‘decision’ vs. ‘judgment’. Whilst recognising the challenge Eva highlighted what an exciting and fulfilling task she has and the participants were all very impressed! If you are a legal English teacher you may find these free EJTN handbooks useful. There are also a limited number of podcasts on the website. 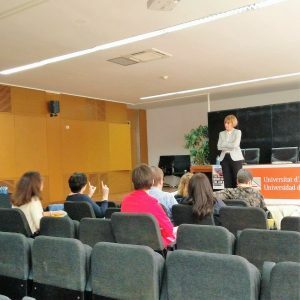 Maria Beatrix Cabello de Alba explained how she teaches grammar in an intensive course on legal English where she teaches the peculiarities of advanced English grammar used in legal English such as of the passive voice, subjunctive, prefixes and complex phrases. She highlights certain legal phrases and vocabulary e.g. ‘in the event of’ and ‘hereby’ and their definitions, examples of usage and general English equivalents. Maria drew the distinction between ‘focus on form’ in which grammar is taught incidentally through a communicative approach, compared to ‘focus on forms’ in which grammar is intentionally and deliberately taught in order to better understand grammar and for students to be able to use it correctly. 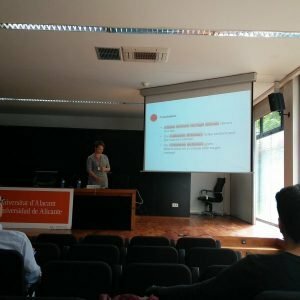 Eva Esteba Vilaplana focused on teaching pronunciation to non-native English speakers, highlighting that she normally has to condense the teaching into a two-hour class! Some common pronunciation difficulties for Spanish speakers are some of the vowel sounds, Latinisms, and rhythmic patterns. For example, some vowel sounds are present in English and not in Spanish such as the Scwha (ə), found in many English words e.g. about [əˈbaʊt], taken [ˈtʰeɪkən] and pencil [ˈpʰɛnsəl]. The pronunciation of Latin terms is different in English compared to Spanish e.g. the English pronunciation of ‘ratio decidendi’ [reɪʃɪəʊ dɛsɪˈdɛndiː]. The rhythmic patterns are also difficult to grasp. Eva demonstrated that she teaches ‘seen’ and ‘sin’ as two beats of rhythm and one beat respectively. She also mentioned the difficulty of certain consonant sounds in English which require aspiration, otherwise they will be misunderstood by native-speakers. For example, ‘path’ without aspiration may sound like ‘bath’. She also highlighted the importance of using a wider pitch range when speaking English. For example, if you say ‘The meal was lovely’ in a monotone voice in English it would convey that they meal was not indeed lovely, whereas ‘La comida estuvo buena’ with the same pitch range as English would sound as if the Spanish speaker was a bit too excited. 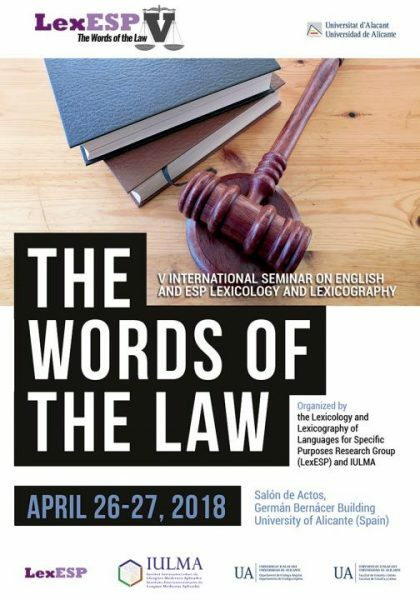 Lucja Biel presented on legal terminology within the EU for EU documents, highlighting that here due to the multi-lingual nature of the EU many English words are used incorrectly, with an intended meaning different to the usage in English because of being translated from another EU language. For example the use of ‘enterprise’ instead of ‘company’ developed from French or ‘undertaking’ instead of ‘company’ developed from German. She described how some consider this as contributing to a new ‘neutral metalanguage’ known as ‘Eurish’ amongst other names. Lucja referred to a helpful document which may be of use to legal English students, teachers and translators to learn about misuse of general English and legal English terms within the EU. ‘A Brief List of Misused English Terminolgy in EU Publications’ was created by Jeremy Gardner, a senior translator at the European Court of Auditors, and lists a number of Eurenglish terms. 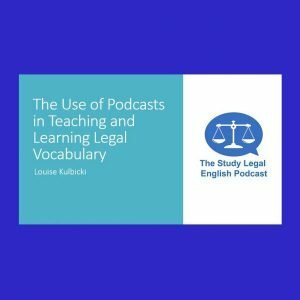 On Thursday evening I (Louise Kulbicki) presented on the different resources available on the Study Legal English website for legal English students and teachers. 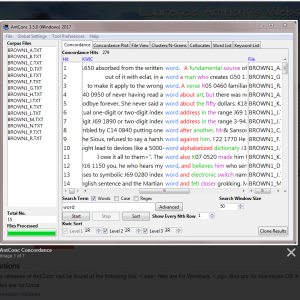 I demonstrated the many free resources available, for example the free legal English courses, podcast and lesson plans, as well as the Study Legal English Podcast Pro features such as synchronised transcripts, vocabulary lists, speak module, quizzes and the achievements users can earn for example certificates and badges. Many participants throughout the conference had mentioned the lack of online resources available and were interested in testing out the website and its resources either as a student or a teacher. Some academics were interested in academic institutional membership. If you are part of an institution and are interested in this please get in touch. You can access my slides here.